The Ivan G. Smith Elementary School, located on Lobao Drive, was built in 1973 as an “open classroom” concept building. The school was awarded the Architectural Award of Excellence in 1975 by the American Institute of Steel Construction for its innovative design; but, almost 45 years later, the building itself has reached the end of its useful life and the education field has moved away from the “open classroom” concept. 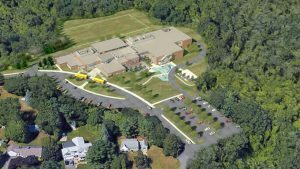 In 2015, the Massachusetts School Building Authority (MSBA) approved the Town’s application to partner on a project to replace the Smith School with a modern facility that is consistent with the other four Danvers elementary schools in terms of instruction, assessment, technology and safety. As a partner, the MSBA will fund more than 50% of allowable project costs. Danvers has a strong track record of working with the MSBA on successful school projects, and the Town maintains a School Construction Stabilization Fund (established in 2000) to ensure that school projects, once approved, have adequate funding in place. The schematic design construction budget summary and cost estimates are available here. A School Building Committee (SBC) was formed in October 2016 and has been working since then with the MSBA to advance through the Authority’s project modules, as noted below. This webpage is meant to serve as a centralized location for neighbors, residents, and stakeholders to find project related news, information, and resources.